이 문서는 다른 언어판 위키백과의 문서(en:Poker Face (Lady Gaga song))를 번역 중이며, 한국어로 좀 더 다듬어져야 합니다. 〈Poker Face〉는 미국 가수 레이디 가가의 데뷔 앨범 《The Fame》에 수록된 노래이다. 레드원이 프로듀서를 맡았으며, 2008년 말 몇몇 국가에서, 2009년 초 나머지 국가에서 앨범의 두 번째 싱글로 발매되었다. 〈Poker Face〉는 빠른 템포의 신스팝 장르 노래로, 이전 싱글 〈Just Dence〉와 같이 A♭ 마이너 키로 쓰였지만, 훨씬 어둡고 고른 음을 가졌다. 노래의 주요 아이디어는 양성애와 가가 자신의 로큰롤 남자친구들에게 바치는 찬사이다. 가사적인 부분에서는 육체적인 관계를 원하면서도 끝내 허락하지 않는 여자들에 대한 내용이다. 〈Poker Face〉는 로보틱한 후크와 코러스에 대한 찬사와 함께 대부분의 비평가들로부터 좋은 평을 받았다. 노래는 세계적인 성공을 거뒀는데, 미국, 영국, 오스트레일리아, 뉴질랜드, 캐나다, 이 외 많은 유럽 국가를 포함해 20개 국가에서 1위를 했다. 특히 2009년 영국 싱글 차트에서 가장 높은 다운로드 판매량을 기록했다. 〈Poker Face〉는 1,400만 건의 판매량을 기록하면서 역사상 가장 많이 팔린 싱글 중 하나가 되었다. 노래의 뮤직비디오에서 가가는 다양한 의상을 입고 노래를 부르며 별장에서 스트립 포커 게임을 하는 장면이 나온다. 가가는 투어 The Fame Ball Tour과 The Monster Ball Tour 뿐만 아니라 《아메리칸 아이돌》 시즌 8에서 〈Poker Face〉 공연을 펼쳤다. 공연은 일렉트로닉 버전과 피아노와 함께 부르는 어쿠스틱 버전으로 보여줬다. 가가는 이 노래로 제52회 그래미상에서 베스트 댄스 레코딩상을 수상했고, 올해의 노래와 올해의 레코드 부문 후보로 지명되었다. 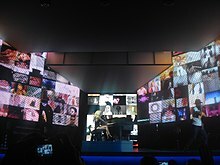 The Monster Ball Tour에서 키드 커디와 함께 피아노 버전의 〈Poker Face〉 공연을 하고 있는 가가. 뒤 화면은 자신의 팬들이 보내준 동영상이다. 〈Poker Face〉는 레드원과 레이디 가가가 작곡했는데, 총 프로듀서는 레드원이 맡았다. 가가는 한 매체와의 인터뷰에서 〈Poker Face〉는 직접 작곡한 팝 노래이자 "록앤롤 남자친구들"에게 받치는 찬사라고 말했다. 또한 노래의 주된 아이디어는 섹스와 도박이라고 말했다. 영국의 《데일리 스타》와의 인터뷰에서 "직접 도박을 하기도 하지만, 섹스, 도박, 술에 매우 관심이 많은 남자들과 사귀어봤다. 그래서 나는 그 남자친구들이 좋아할만한 노래를 만들고 싶었다"라고 노래에 대해 언급했다. 《롤링 스톤》과의 인터뷰에서는 "bluffin' with my muffin"이 무슨 뜻이냐는 질문에 대해 가가는 자신의 외음부를 비유한 것이라고 답했다. "분명히 말하지만, 이 가사는 내 외음부의 포커페이스에 대한 것이에요! 발매 되지 않은 'Blueberry Kisses'라는 노래에서 이 가사를 따왔죠. 'Blueberry Kisses'라는 노래는 한 여자가 자신의 남자친구에게 얼마나 커닐링구스를 하고싶냐고 묻는 내용이에요. 'Blueberry kisses, the muffin man misses them kisses'(가가가 직접 노래함) 이 부분에서 가사를 가져왔죠." 2009년 4월 11일 가가는 캘리포니아주 팜스프링스에서 열린 The Fame Ball Tour 중 관객들에게 〈Poker Face〉에 담긴 진짜 의미를 설명했다. 그 의미는 가가의 바이섹슈얼과 그렇게 살아간 경험에 대한 내용이라고 말했다. 노래에서 남성과 함께여도 다른 여성을 생각하는 여성의 마음을 이해하려면 남성은 그 여성의 포커페이스를 읽을 필요가 있다고 설명한다. 〈"Poker Face〉는 이전 싱글 〈Just Dance〉와 같이 신스팝 장르의 노래이다. 〈Just Dance〉는 일렉트로팝 요소가 뚜렷한 반면, 〈Poker Face〉는 후렴구와 후크 부분에서 알아듣기 쉬운 보컬과 함께 어두운 사운드로 이끌어 간다. 또한 〈Just Dance〉의 신디사이저 음과 〈LoveGame〉의 댄스 지향적인 비트가 합쳐졌다. 《빌보드》의 케리 맨슨은 구성에 대해 "다운타운 뉴욕이 아닌 어둡고 반항적인 언더그라운드와 FM 다이얼을 잃지 않은 채 플레더 앤 스쿼드를 전달한다"고 말했다. 소니/ATV 뮤직 퍼블리싱의 Musicnotes.com 중 음악 출판부에 따르면 〈Poker Face〉는 120 비트 퍼 미닛의 빠른 템포와 함께 4분의 4박자로 구성되어 있다고 한다. 또한 가단조 키로 만들어졌으며, 가가의 음역대는 G3에서 C5까지 측정되었다. 노래는 미디엄 템포의 기계음 도입부와 함께 "Mum-mum-mum-mah"하는 후크로 시작된다. 코드는 Am–F/A–G를 따르며, 후렴구 부분에서는 Am–F–C–G를 따른다. 파워풀한 인스트루먼트 비트, 후렴구에 따라 더듬거리는 후크로 제작된, 전형적인 댄스 음악의 형식을 따른다. 가사적인 부분에서 〈Poker Face〉는 성적 풍자에 대한 내용이 주를 이룬다. 《데일리 스타》에 따르면 후렴구는 두 개의 가사가 번갈아가면서 반복된다고 한다. "Can't read my Poker Face" 후크 이후 백보컬이 "He's got me like nobody"라고 말한 다음 "She's got me like nobody"라고 말한다. 가가는 인터뷰에서 이부분에 대해 사랑과 육체적 사랑에 대한 혼란스러움이라는 숨은뜻을 전달한다고 말했다. 하지만 앨범 북클릿 라이너 노트에서 위의 두 개 가사 중 "she's got me like nobody"만 써있다. BBC는 "Mum-mum-mum-mah" 후크는 보니 엠의 1977년 히트곡 〈Ma Baker〉를 참조해 사용했다고 말했다. The Monster Ball Tour에서 총으로 된 드레스를 입고 〈Poker Face〉 공연 중인 가가. 〈Poker Face〉가 발매되자 많은 평론가들은 좋은 평론을 내렸다. 《타임스》의 프리야 엘렌은 《The Fame》 리뷰에서 〈Poker Face〉는 앨범의 가장 멋진 순간 중 하나라고 말했다. BBC 뮤직은 "명성과 행운을 위한 가가의 강한 바람을 표현했다"고 리뷰했다. About.com의 빌 램브는 "〈Poker Face〉는 팝 라디오에서는 잘 맞지만 약간의 믹싱을 바꾸면 어둡고 축축한 늦은 밤의 파티 분위기를 집에서도 똑같이 느낄 수 있을 것이다. 가가는 느리게 돌아가는 미국과 영국의 팝 세계에 활기를 찾아줬다. 〈Poker Face〉는 모두가 기다릴 가가의 다음 단계를 위한 모터로 남을 것이다"라고 리뷰했다. 《빌보드》의 크리스 윌리암스 역시 긍정적인 리뷰를 하며 "후크는 필요 이상 많고, 80년대에서 영감을 받은 신디사이저, 로보틱한 벌스, 후렴구에서 따스하고 산뜻한 후크는 이전 싱글 〈Just Dance〉보다 훨씬 더 중독성 있다...With a focused artistic vision, a swagger in her interview style and above all, a fantastic collection of diverse pop nuggets, Gaga is playing her cards right—and "Poker" is another obvious ace." Slant Magazine music reviewer Sal Cinquemani included "Poker Face" among the songs that work in The Fame, namely tracks like "Starstruck," "Paper Gangsta" and "Summerboy". Matthew Chisling from Allmusic called the song "infectious" and along with the title track "The Fame", complimented them for "rejuvenating the vibe on the album for its second half." Andy Downing from The Chicago Tribune called the song "jaunty" while reviewing Gaga's Fame Ball tour. Evan Sawdey from PopMatters.com felt that "Poker Face" along with the track "Paparazzi", duplicate much of the same "glitzy territory that previous single 'Just Dance' had covered, but never once does it feel like Gaga is deliberately repeating herself." Rolling Stone in a review for The Fame Ball Tour compared the live acoustic "bluesy" version of "Poker Face" with the music of singer Amy Winehouse. Erika Hobert from the New Times Broward-Palm Beach newspaper called the song "trashtastic Europop." The song was nominated for Grammy Awards in the categories for Song of The Year, Record of The Year, and Best Dance Recording, ultimately winning the last of these. Rolling Stone ranked it number ninety-six on their list of 100 Best Songs of the 2000s decade. In October 2011, NME placed it at number 103 on its list "150 Best Tracks of the Past 15 Years". 《The Fame》의 라이너 노트를 참고한 것이다. Since May 9, 2013, RIAA certifications for digital singles include on-demand audio and/or video song streams in addition to downloads, resulting in the 9× Platinum certification for the track. ↑ “"Poker Face" writing credits” (영어). BMI. 2012년 4월 16일에 원본 문서에서 보존된 문서. 2010년 4월 19일에 확인함. ↑ McKay, Hollie (2009년 5월 22일). “Lady Gaga Opens Up About Her Preference for Boys That Look Like Girls”. 《Fox News Channel》 (영어) (News Corporation). 2009년 5월 24일에 원본 문서에서 보존된 문서. 2009년 4월 28일에 확인함. ↑ 가 나 Beysil, Kim (2009년 4월 1일). “Lady Gaga's Hot Secret”. 《데일리 스타》 (영어) (Northern & Shell). 2009년 4월 10일에 확인함. ↑ Scaggs, Austin (2009년 2월 19일). “The "Just Dance" singer on leotards, the first lady and raunchy lyrics”. 《롤링 스톤》 (영어) (Jann Wenner). ISSN 0035-791X. ↑ “Lady GaGa Entertains Thousands At Palm Springs White Party”. 《액세스 할리우드》 (영어). NBC. 2009년 4월 14일. 2009년 4월 17일에 확인함. ↑ Hudson, John (2010년 2월 25일). “Lady Gaga's Ambiguous Feminism”. 《The Wire》. 2013년 9월 20일에 확인함. Ever since Lady Gaga stormed the airwaves with her synth-pop super-hit Poker Face, she's been an irresistible enigma to culture critics. ↑ 가 나 다 Lamb, Bill (2008년 11월 12일). “Lady GaGa – "Poker Face"”. About.com. 2009년 3월 18일에 확인함. ↑ Norman, Ben (2008년 10월 2일). “Lady Gaga – 'The Fame'”. About.com. 2008년 3월 18일에 확인함. ↑ Mason, Kerri (2008년 11월 1일). “The Fame”. 《Billboard》. 2009년 4월 16일에 보존된 문서. 2009년 3월 17일에 확인함. ↑ 가 나 “Lady Gaga 'Poker Face' Sheet Music”. Musicnotes.com. Sony/ATV Music Publishing. 2014년 7월 6일에 확인함. ↑ McAlpine, Fraser (2009년 3월 11일). “Lady GaGa – 'Poker Face'”. BBC. BBC. 2009년 3월 17일에 확인함. ↑ Elan, Priya (2008년 10월 10일). “The Big CD: Lady GaGa – The Fame”. 《타임스》 (영어) (런던). 2008년 2월 3일에 확인함. ↑ Music group (2008년 10월 9일). “BBC review of The Fame” (영어). BBC. 2009년 1월 2일에 확인함. ↑ Williams, Chris (2009년 2월 28일). “Single Reviews: Poker Face”. 《Billboard》. 2009년 2월 28일에 확인함. ↑ Cinquemani, Sal (2008년 10월 25일). “Lady GaGa: The Fame review”. 《Slant Magazine》. 2009년 3월 6일에 원본 문서에서 보존된 문서. 2009년 4월 14일에 확인함. ↑ Chisling, Matthew (2008년 9월 28일). [(영어) https://www.allmusic.com/album/r1421208/review “allmusic ((( The Fame > Overview )))”] |url= 값 확인 필요 (도움말). AllMusic. 2009년 4월 14일에 확인함. ↑ Downing, Andy (2009년 3월 26일). “Lady Gaga delights”. 《Chicago Tribune》. 2012년 10월 24일에 원본 문서에서 보존된 문서. 2009년 4월 14일에 확인함. ↑ Sawdey, Evan (2009년 1월 12일). “The Fame by Lady Gaga”. 《PopMatters》. 2009년 4월 14일에 확인함. ↑ Wood, Mikael (2009년 3월 16일). “Lady Gaga's 'Fame' Attracts Kanye West, Perez Hilton to L.A. Show”. 《Rolling Stones》. ISSN 0035-791X. ↑ Hobart, Erika (2009년 3월 31일). “Some Like It Pop”. 《New Times Broward-Palm Beach》. New Times Media. 2009년 4월 15일에 확인함. ↑ Whey, Simon (2010년 2월 1일). “Swift reward: Taylor's Grammy double”. 《The Guardian》 (London: Guardian News and Media). 2010년 2월 1일에 확인함. ↑ Montogomery, James (2009년 12월 2일). “Grammy Nominations Special: Beyonce, Lady Gaga, Taylor Swift Lead Pack”. MTV. 2009년 12월 3일에 확인함. ↑ “100 Best Songs of the Decade: Rolling Stone”. 《Rolling Stone》. 2009년 12월 9일. ISSN 0035-791X. ↑ “150 Best Tracks Of The Past 15 Years”. 《NME》. 2012년 11월 5일에 확인함. ↑ 가 나 다 라 마 바 “Poker Face track listing” (네덜란드어). Ultratop. 2009년 3월 2일에 확인함. ↑ “Lady Gaga – Poker Face (2-Track)” (독일어). Musicline.de. PHONONET GmbH. 2009년 9월 13일에 확인함. ↑ 가 나 “Poker Face (Maxi Single)” (독일어). Amazon.com. 2013년 9월 20일에 확인함. ↑ 《The Fame》 (CD liner notes). 레이디 가가. 인터스코프 레코드. 2008. ↑ “Single (track) Top 10 lista – 2009. 39. hét”. 《Mahasz》 (헝가리어). 2012년 4월 16일에 원본 문서에서 보존된 문서. 2010년 1월 1일에 확인함. ↑ “Poker Face on world charts”. 《acharts.us》. 2009년 9월 15일에 확인함. ↑ “Lady Gaga este number one în Statele Unite, Marea Britanie şi România!”. sensotv.ro. 2010년 1월 23일에 원본 문서에서 보존된 문서. 2010년 3월 10일에 확인함. ↑ “RADIO TOP100 Oficiálna – Lady Gaga – Poker Face”. International Federation of the Phonographic Industry. IFPIcr.cz. 2010년 7월 15일에 확인함. ↑ 가 나 다 “allmusic ((( Lady Gaga > Charts & Awards > Billboard Singles)))”. 올뮤직 Rovi Corporation. 2010년 4월 5일에 확인함. ↑ “ARIA Charts – End Of Year Charts – Top 100 Singles 2008” (영어). ARIA. 2009년 12월 23일에 확인함. ↑ “Annual Top 50 Singles Chart 2008” (영어). RIAN. 2012년 1월 17일에 원본 문서에서 보존된 문서. 2009년 12월 26일에 확인함. ↑ “Rock-ul, cenzurat de posturile româneşti de radio” (루마니아어). Telegraful. 2010년 2월 11일에 원본 문서에서 보존된 문서. 2009년 1월 10일에 확인함. ↑ “ARIA Charts – End Of Year Charts – Top 100 Singles 2009”. Australian Recording Industry Association. 2010년 1월 9일에 확인함. ↑ “2009 Year End Austrian Singles Chart”. Ö3 Austria Top 40. 2009. 2010년 7월 16일에 확인함. ↑ “Jaaroverzichten 2009 (Flanders)” (네덜란드어). Ultratop. 2009년 12월 26일에 확인함. ↑ “Rapports Annuels 2009 (Wallonia)” (프랑스어). Ultratop. 2009년 12월 26일에 확인함. ↑ “Charts Year End: Canadian Hot 100”. 《빌보드 지》. Nielsen Business Media, Inc. 2009년 12월 19일. 2009년 12월 23일에 확인함. ↑ “Danish Year End 2009”. Tracklisten. 2011년 1월 22일에 원본 문서에서 보존된 문서. 2010년 5월 7일에 확인함. ↑ “Dutch Top 40 Year End”. MegaCharts. 2010년 5월 6일에 확인함. ↑ “2009 Year End: European Hot 100 Singles”. 《빌보드 지》. Nielsen Business Media, Inc. 2009년 12월 19일. 2012년 9월 5일에 보존된 문서. 2009년 12월 23일에 확인함. ↑ “Best selling digital singles in 2009 in France” (PDF). Syndicat National de l'Édition Phonographique. 30쪽. 2010년 1월 27일에 확인함. ↑ “Charts Year End: German Singles Chart”. 《Viva》. Media Control Charts. 2009년 12월 29일. 2012년 4월 16일에 원본 문서에서 보존된 문서. 2011년 1월 15일에 확인함. ↑ “Éves összesített listák - MAHASZ Rádiós TOP 100 (súlyozott)”. 《Mahasz》. Mahasz. ↑ “Best of 2009”. Irish Recorded Music Association. 2010년 7월 13일에 확인함. ↑ “Chart: PROMUSICAE 2009” (PDF). Productores de Música de España. 2010년 2월 4일에 확인함. ↑ “Årslista Singlar – År 2009”. Swedish Recording Industry Association. 2011년 7월 19일에 원본 문서에서 보존된 문서. 2010년 10월 9일에 확인함. ↑ “2009 Year End Swiss Singles Chart”. Swiss Music Charts. 2009. 2010년 7월 16일에 확인함. ↑ “Charts Year End: The Billboard Hot 100”. 《빌보드 지》. Nielsen Business Media, Inc. 2009년 12월 19일. 2012년 6월 30일에 원본 문서에서 보존된 문서. 2009년 12월 23일에 확인함. ↑ “2010년 디지털 종합 (국외) 연말 차트”. 가온 차트. 2011년 11월 13일에 확인함. ↑ “2010 Year End Charts - European Hot 100 Singles”. 《빌보드》 (영어). Nielsen Business Media, Inc. 2011년 6월 22일에 확인함. ↑ “レコード協会調べ 2009年12月16日～2010年12月14日「着うたフル(R)」 2010年有料音楽配信「年間チャート」（通称：レコ協チャート）” [Record Association Analysis: December 16, 2009—December 14, 2010 Full-length Cellphone Download 2010 paid digital sales "Yearly Chart" (Abbreviated: RIAJ Chart)] (PDF) (일본어). RIAJ. 2010년 12월 20일. 2010년 12월 22일에 확인함. ↑ “UK Year-End Charts 2010” (PDF) (영어). 더 오피셜 차트 컴퍼니. ChartsPlus. 2011년 6월 22일에 확인함. ↑ Kathy, McCabe (2010년 7월 1일). “Delta Goodrem's talents top the charts” (영어). 데일리텔레그래프. 2010년 10월 1일에 확인함. ↑ “Radio 1 to reveal best-selling singles and albums of Noughties”. 《BBC》 (영어) (BBC 온라인). 2009년 12월 28일. 2010년 1월 12일에 확인함. ↑ “The Billboard Hot 100 Decade End Charts(빌보드 핫 100 10년간 차트)”. 《빌보드》 (영어). Nielsen Business Media, Inc. 2009년 12월 31일. 2012년 7월 23일에 보존된 문서. 2010년 6월 6일에 확인함. ↑ Durand, Dominic. “InfoDisc : Les Meilleurs Ventes de Singles en 2009!” (프랑스어). InfoDisc. 2014년 3월 30일에 원본 문서에서 보존된 문서. 2013년 7월 29일에 확인함. ↑ “November 2010 Report” (일본어). Recording Industry Association of Japan. 2015년 5월 8일에 확인함. ↑ “February 2011 Report” (일본어). Recording Industry Association of Japan. 2015년 5월 8일에 확인함. ↑ “Guld & Platina – År 2009” (PDF) (스웨덴어). IFPI Sweden. 2009년 10월 9일. 2011년 6월 16일에 원본 문서 (PDF)에서 보존된 문서. 2013년 9월 20일에 확인함. ↑ “Get Lucky becomes one of the UK’s biggest selling singles of all-time!”. 《OfficialCharts》. 2013년 6월 27일. 2015년 6월 12일에 확인함. ↑ Trust, Gary (2018년 2월 25일). “Ask Billboard: Lady Gaga's Career Sales, The Biggest No. 2 Hits & Ed Sheeran's Latest Chart Record”. 《Billboard》. 2018년 2월 25일에 확인함. ↑ “RIAA Adds Digital Streams To Historic Gold & Platinum Awards”. Recording Industry Association of America. 2013년 5월 9일. 2013년 5월 9일에 확인함. ↑ “Poker Face – Single by Lady Gaga”. iTunes Store Australia. Apple. 2013년 9월 20일에 확인함. ↑ “Poker Face”. Sanity. 2013년 9월 20일에 확인함. ↑ “Poker Face (Remixes) – EP by Lady Gaga”. iTunes Store UK. Apple. 2013년 9월 20일에 확인함. ↑ “Poker Face by Lady Gaga”. iTunes Store France. Apple. 2013년 9월 20일에 확인함. ↑ “Poker Face – EP by Lady Gaga”. iTunes Store France. Apple. 2013년 9월 20일에 확인함. ↑ “Poker face – Lady Gaga – CD single” (프랑스어). Fnac. 2013년 9월 21일에 원본 문서에서 보존된 문서. 2013년 9월 20일에 확인함. ↑ “CHR – 2009”. 《FMQB》. 2013년 9월 20일에 확인함. ↑ “LADY GAGA | Poker Face” (독일어). Universal Music Germany. 2013년 9월 20일에 확인함. ↑ “Poker Face – EP by Lady Gaga”. iTunes Store Germany. Apple. 2013년 9월 20일에 확인함. ↑ “Poker Face Remixes”. Amazon.com. 2013년 9월 20일에 확인함. ↑ “Poker Face – EP by Lady Gaga”. iTunes Store UK. Apple. 2013년 9월 20일에 확인함. ↑ “Poker Face”. Amazon.com. 2013년 9월 20일에 확인함. ↑ “Poker Face [7" VINYL]”. Amazon.com. 2013년 9월 20일에 확인함. ↑ “Poker Face (Remixes) – EP by Lady Gaga”. iTunes Store Germany. Apple. 2013년 9월 20일에 확인함. 이 문서는 2018년 11월 25일 (일) 11:37에 마지막으로 편집되었습니다.